Sam Heazlett (76) in action for Redlands against Sandgate-Redcliffe on Saturday. (Photo: Doug O'Neill). 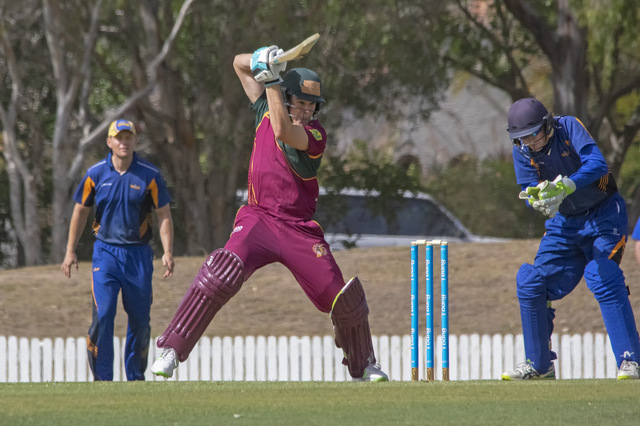 Premier Grade Cricket returned on Saturday with two mouth-watering clashes to whet the appetite for a blockbuster summer of cricket at Tiger Land. First grade got their season underway against Sandgate-Redcliffe away from home in a one-day clash, and after winning the toss and electing to bat, piled on 290 from their allotted 50 overs. The Tigers top order flew out of the blocks, with Queensland representative Sam Heazlett (76) and Liam Smith (55) combining for a 131 run opening stand. Sam Howse continued the top order’s dominance with 26, before skipper Leigh Drennan (34) and Steven Moss (25) helped the Tigers towards an imposing total. Charles Mailli also chimed in with a crucial innings of 27 just as the innings looked like it might fall away. Ben Long and James Bazley were quick to take their first wickets of the season when the Tigers took to the field, as Sandgate-Redcliffe’s openers went without troubling the scorers. But this was as good as it got for the Tigers bowlers. A mammoth 207 run partnership for the fourth wicket and a century for Sandgate-Redcliffe’s skipper quickly put paid to Redlands’ hopes of beginning the season with a victory. Fortunately, second grade ensured the Tigers wouldn’t walk away from the opening weekend empty handed. After winning the toss an electing to bowl on a Peter Burge wicket that had seen plenty of runs in last Wednesday’s exhibition match between Queensland and Victoria, the Tigers bowlers made short work of Sandgate-Redcliffe’s top order. Jamie Ryan had the ball on a string, collecting the first 5 wicket haul of the new season and conceding just 9 runs in the process. Tigers debutant Charles Evans (2 wickets) was also instrumental in helping his teammates dismiss Sandgate-Redcliffe for a sub-par total of 74. With the afternoon sun beaming, Josh Guy picked up where he left off last season, scoring an unbeaten half century from 41 deliveries to see the home side over the line in the 15th over. A double-bonus point victory should see the Tigers go into next weekend’s away clash with Western Suburbs on top of the table. First grade take on the same opposition in their first game on Peter Burge Oval this season, while the Lord’s Taverners side begin with an away clash against Ipswich/Logan on Sunday. First Grade: Redlands Tigers 290 (S. Heazlett 76, L. Smith 55, L. Drennan 34, C. Mailli 27, S. Howse 26, S. Moss 25) def. by Sandgate-Redcliffe 3/292 (J. Bazley 1/29). Second Grade: Sandgate-Redcliffe 74 (J. Ryan 5/9, C. Evans 2/20) def. by Redlands Tigers 1/77 (J. Guy 51*, M. Drennan 19).